Bartender-about-town Kevin Diedrich has officially unveiled his own cocktail bar, Pacific Cocktail Haven (PCH) in the old Cantina space. And he’s brought his dog, Kona, with him. If you’ve ever tasted a Diedrich signature (which you probably have, if you’ve had a cocktail in SF in the last 10 years: he’s best known for crafting delicious libations at hotel bars Burritt Room, Jasper’s, and BDK), then you know you don’t really need to read any further. It’s a neighborhood bar, helmed by Kevin Diedrich. There’s a dog. Enough said. Kevin teamed up with Sidecar Hospitality (Schroeder’s, Press Club) to purchase Cantina, a long-time cocktail haunt and industry-hang in Union Square in December. 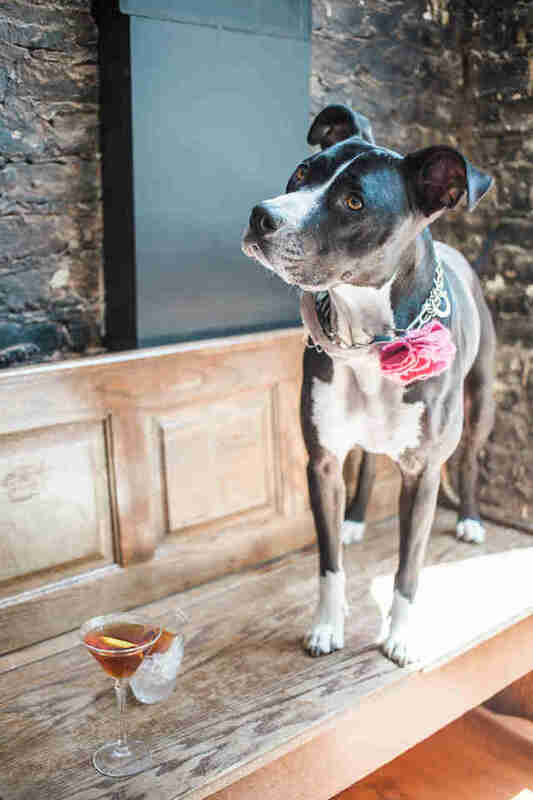 For six months, the team incubated the new cocktail bar concept with Turnkey, a pop-up inside Cantina that he operated while refreshing the spot's narrow interior. And this week, the refreshed design and brand-new, 18-deep cocktail menu ($11-$13) is ready to delight and confound your taste buds. While the pop-up menu was an ode to Kevin’s greatest hits -- largely from the short-lived BDK -- the new menu is like taking a virtual tour of his favorite San Francisco haunts, particularly their dessert menus. A testament to Kevin’s advanced palate, cocktail genius, and love of pastries, he translates a pineapple macaroon from B. Patisserie into a saffron-infused mezcal concoction with grilled pineapple (The Saffron pictured above). 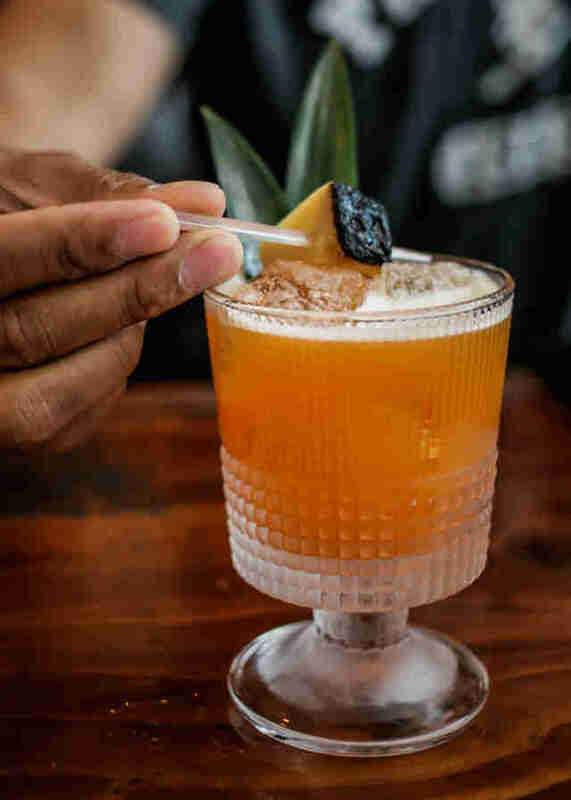 Inspired by the miso-honey butter spread that comes with cornbread at Old Bus Tavern, he formed the Miso Old Fashioned, which blends miso butter, rum, apple brandy, and bitters into a silky, textural libation with both savory and sweet notes. 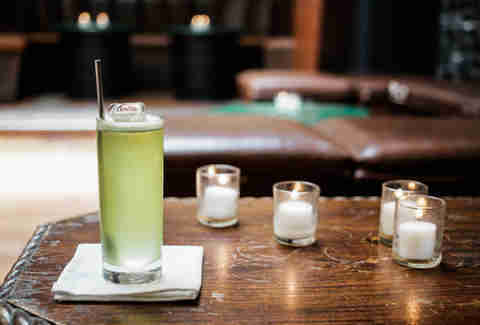 Other innovation lies in his twists on the classics, such as the Naked Mai Tai, which strips the Mai Tai of its citrus. Or in the Oh Snap, which adds a surprising -- even healthy -- touch with fresh sugar snap peas. 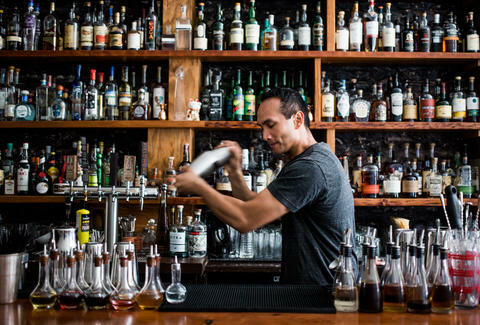 Over the past six months, when he wasn’t translating sophisticated pastry recipes into boozy libations, Kevin has been modernizing and brightening Cantina’s interior himself -- often from 4am until it was time to start slinging drinks. It turns out that drilling into walls just before a night’s service allowed him to strike real-estate gold: the building’s original brick is now exposed, making the space about 2ft wider, and he also unearthed a skylight in the back, which was covered up during Cantina’s reign -- perhaps its only misstep. 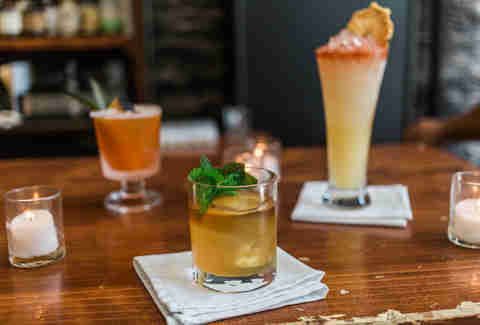 Patrons now get the same cocktail culture and neighborhood vibe of Cantina, but in a brighter, more open space with understated furnishings that put the beautiful back-bar and Kevin’s drinks front-and-center. **For your best chance at drinking with Kona, head to PCH when it opens at 5pm before the dog’s bedtime.